Designed for high power applications in PA speaker mains, DJ touring speakers, sub-woofers and bass guitar systems the new Rockville Bass Rider Subwoofers are a milestone in high-power subwoofer design. The 18” woofers have an incredible power handling of 900 watts RMS/1800 watts peak. These “extra-long throw” woofers can reach amazing sound pressure levels of 105dB with clean, deep bass down to 20Hz that will rattle the walls of any venue! Utilizing a new propriety mix of materials; the cones are Kevlar-impregnated making them stronger and tougher than your average pro audio woofer cone. A newly designed “treated asymmetrical-W shape surround” provides for superior excursion and linear motion control. The speaker connection terminals are high quality nickel-plated screw style terminals and accept large gauge wire. The terminals are attached to large diameter, high current tinsel leads with silver solder to withstand high current and high temperatures during long excursions. The Rockville Bass Rider woofers’ voice coil use a specially formulated, polyimide-insulated, high temperature wire, designed especially for high SPL response. The winding is bonded onto an incredibly durable and heat resistant aluminum composite former. The voice coil winding length is an incredible 1”, which is 80% longer than most standard pro woofers voice coils. The long coil dissipates heat over a larger area and the increased length drives the cone to higher excursions. The coil is layered with a tough thermoset clear epoxy for added durability, abrasion and heat resistance. The voice coil assembly is bonded to the cone’s “double, linear-progressive Nomex spider”, using a thermoset epoxy adhesive. The spider and surround are bonded to the frame with a high strength cyanoacrylate adhesive, which is also used to bond the dust cap to the cone. 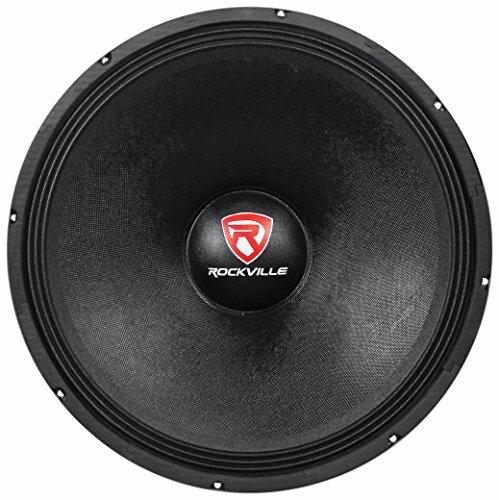 The Rockville Bass Rider woofers' voice coil use a specially formulated, polyimide-insulated, high temperature wire, designed especially for high SPL response. The winding is bonded onto an incredibly durable and heat resistant aluminum composite former. The voice coil winding length is an incredible 1", which is 80% longer than most standard pro woofers voice coils. The long coil dissipates heat over a larger area and the increased length drives the cone to higher excursions. The voice coil assembly is bonded to the cone's "double, linear-progressive Nomex spider", using a thermoset epoxy adhesive. The spider and surround are bonded to the frame with a high strength cyanoacrylate adhesive, which is also used to bond the dust cap to the cone. The magnet motor structure is all new, and designed with a back plate and pole piece which are forged from a single massive block of low carbon steel. Utilizing an extended pole piece beyond the front plate improves magnetic linearity and voice coil cooling. The yoke and washer plates are 10 mm thick for extreme X-max and peak-to-peak excursions. With a narrow gap design and a high "Y" factor strontium magnet, Rockville Bass Rider subwoofers provide 75% more magnetic energy in the voice coil gap than typical pro audio woofers.